Have a little girl you loves to cheer! Whether she cheers for her school or competitively we have so many cheerleading party supplies for you to plan her a fabulous cheer party! You can browse and sort all of our cheerleading decorations here or use the search feature above. We have Cheerleading Cut outs in several different team colors and cheerleading megaphones that make great party gifts. 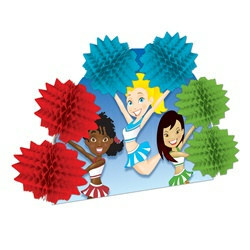 Cheerleading party supplies can also be used for you to cheer with at the sports games. If you're coaching a girls cheerleading team we also offer discount on bulk orders if you are looking to purchase Poly shakers for your team! And of course we always love hearing from our very loyal customers! If you have any questions or ideas for new products feel free to give us a call or leave us a message! We’d be happy to hear from you! And who knows? You might just see your idea on our website in the near future! No matter what kind of cheerleading party supplies and other party decorations you’re looking for we’ve got you covered! We’re PartyCheap.com and we know how to party! Throwing an end of the year party for the cheerleaders that cheered all year at your sports games? Show them how much you appreciated their encouragement on the side of the field and court. We have all sorts of cheerleading supplies for you to plan a fun, cheer party. We also offer a variety of colors in our cheerleading decorations so you can get your supplies in your school's colors if you're decorating for sports banquets. Some of our most popular products include our Poly Shakers, which are popular for coaches to get for their cheerleading squad. We also have 'Number 1' and Trophy Cup awards that you can get to award your squad with at the end of the season for all their dedication and hard work cheering. Our Cheerleading photo holder is also a very popular gift that coaches present to their squad. Our Cheer Megaphone Necklaces are also popular and great to pass out to your team and come in 9 different colors. Cheerleaders work just as hard as all other sports so of course they deserve to be celebrated! Plan a cheerleading birthday party or end of the season banquet today! 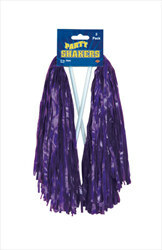 Get cheap decorations for cheerleading parties and promotional events right here at www.PartyCheap.com.